Since we originally wrote this blog, we have learned a lot more about these pins thanks to collectors and customers. Click here to see our updated blog. Dean's Cards has just added a nice collection of Crane's Pins and Guy's Pins to the inventory of DeansCards.com The potato chip pins of the 1960s may comprise the most interesting and yet poorly understood areas of the memorabilia world. The pins are stamped with the logo of Guy's Potato Chips, located in Kansas City, or Crane's Potato Chips in Decatur, Illinois. The Guy's Potato Chip pins are the better known product and therefore more information is readily available. Guy's Chips is still currently in business and continues to produce snacks. Crane's, however, was purchased by a larger food corporation several years ago. The pins themselves were made by Crane's in 1961, 1964, and 1965 and by Guy's in 1962, 1965, and 1966. 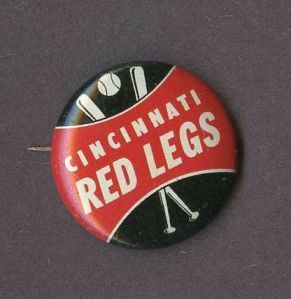 The pins from each issuer can be easily confused with the other because the same basic team logos were used, but the coloration varies from set to set. One easy way to tell who made the pins is to look on the back, where there is a stamped logo. The year can be determined by looking on the back in some cases. The Guy's pins from 1962 have a blank back, but the 1965 and 1966 pins have the date stamped on the back. Only the 1961 set from Crane's has the date stamped on them. The coloration on the front of the pins varies greatly. The 1961 and 1965 Crane's pins are almost identical, but they vary in blue and black ink. They are filled in with white, red, and either blue or black colors. 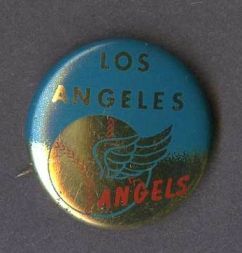 The 19 64 Crane's pins have a gold metallic sheen and then red and blue ink over that. The 1964 pins show damage more readily than the fully colored pins and are therefore harder to find in decent condition. All of the Guy's pins are fully filled in with an art deco style color scheme. The Guy's company made much more colorful pins when compared to the Crane's company pins. These pins have become more popular in recent years and are now even graded by PSA. These pins also include past teams such as the Washington Nationals and the Houston Colt .45s If you have any information on these pins or collected them as a kid, I would love to hear about it. 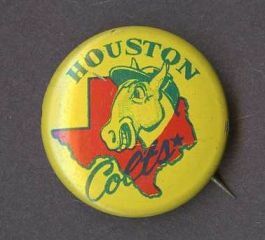 I recently found a few of these pins from Guys. I'm guessing that I have 8 or the 12 teams on a sheet of paper from Guys. I also have some duplicates. I'd like to determine the value on these or see if there is a market to sell them. Are the checklist for all these sets the same 20 pins? Nancy - is there any chance you could send us a picture of the baseball? I have a 75 pc. collection of the chip pins, all 20 teams mention in the previous blog plus the following in addition..